Super easy Lemon Cake Recipe. Moist, lemony, and delicious. 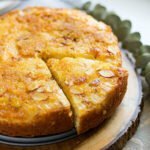 The bottom is layered with brown sugar, apple, and almonds. Enjoy the taste of caramelized fruit while having a great cake. Preheat oven to 350F/180C. Line your 8” baking pan (I used springform) with parchment paper. Keep aside. Sift the flour, baking powder, baking soda, and salt. Keep aside. In a bowl, add the sugar, vanilla, and the eggs. Beat until the mixture is creamy and light in color. Add the lemon juice, lemon zest, buttermilk, and oil to the wet mixture and mix for two minutes until combined. Add the flour and mix gently for few seconds. Ignore the lumps if you see any, but don’t mix the batter for more than 30 seconds or the cake won’t be light in texture. Distribute the brown sugar evenly to the bottom of the baking pan to cover it. Sprinkle the almond slices over the brown sugar. Evenly layer the apple slices over the almond and brown sugar. Pour the cake batter over the layered apple slices. Tap the baking pan one time and gently over the kitchen counter to release any air bubbles. Bake the cake for 50 minutes or until a toothpick inserted in the middle of the cake come out clean. Let the cake cool in the pan for 9 minutes, then flip on a wire rack (bottom of the cake should be facing up while cooking on the wire rack.). When the cake is completely cool, cut into slices and enjoy with coffee or tea. © MUNATY COOKING. All images & content are copyright protected. Please do not use my images without prior permission.